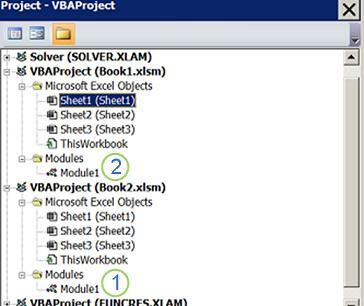 If a workbook contains a Visual Basic for Applications (VBA) macro that you would like to use elsewhere, you can copy the module that contains that macro to another open workbook by using the Visual Basic Editor (VBE). For Windows, go to File > Options > Customize Ribbon. For Mac, go to Excel > Preferences... > Ribbon & Toolbar. Next, in the Customize the Ribbon section, under Main Tabs, check the Developer check box. If you are unfamiliar with macros and VBA in general, you may find the following information helpful. A macro is an action or set of actions that you can use to automate tasks. You can record macros by using the Record Macro command on the Developer tab. Macros are recorded in the VBA programming language. 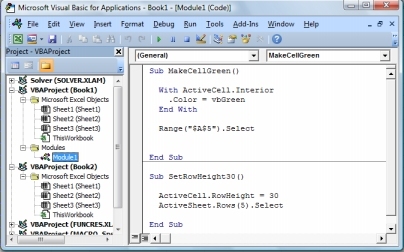 Macros named MakeCellGreen and SetRowHeight are in a module named Module1, which is stored in Book1. Open both the workbook that contains the macro you want to copy, and the workbook where you want to copy it. On the Developer tab, click Visual Basic to open the Visual Basic Editor. In the Visual Basic Editor, on the View menu, click Project Explorer , or press CTRL+R . In the Project Explorer pane, drag the module containing the macro you want to copy to the destination workbook. In this case, we're copying Module1 from Book2.xlsm to Book1.xlsm.